Chris Lundy graduated from the Coleraine campus in 1975 with a BA in History of Resource Management and in 1981 with a DPhil in Geography. I remember the University being very small, so much so that everyone knew each other. There were so few students to play sport that typically staff joined in to play alongside. Most of my memories of my time as a student at Coleraine are around sport. I was involved in all types of sport, both playing and helping to manage/organise. Coleraine was leading the way in sport in those days. In the early years 1968 - 1980, starting from a green field and with newly formed clubs the Athletic Union, with the exception of a few individuals, did not have much to celebrate on the playing field. However, from such a small campus and a new university, unbelievable things were achieved off the field. - In 1977 we successfully ran the British Universities Sports Federation (BUSF) Womens Hockey tournament. - In 1980 the World Universities Cross Country Championships. - In 2000 we ran the World Universities Golf Championships, making Coleraine one of the few universities around the world to organise world universities sports championships in two different sports. This was made possible by the contribution made to BUSF by students and staff at NNU/UUC. 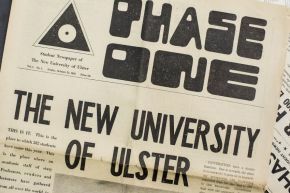 Professor Alan Sharp (later Provost of the Coleraine campus) was President of BUSF and was instrumental in bringing together the various students sports bodies from the universities, polytechnics and colleges into a single organisation. Professor Dave Eastwood (Environmental Sciences) was Treasurer of BUSF, and I was Chair of the Development Committee. Others such as Dr Tom Stark and Phil Carson were members of the BUSF football and cricket committees respectively. We were also instrumental in bringing the World University Games to Sheffield in 1991 and Professor Sharp was the Chef de Mission for at least two World Student Games, with Phil Carson being the Irish Chef de Mission at Sheffield. So in many respects, the management and direction of student sport throughout these islands was very much centred on the Coleraine campus for a number of years. Most recently I was able to make connections between the Confucius Institute and the Sports Department which resulted in the UU Gaelic Football team undertaking a tour of China. The people that stand out most for me were Alan Sharp, Dave Eastwood, Sam Logan (Chemistry), Tom Stark and Phil Carson (Sport).